His wife is there again. He’s said it’s a private failing. It’s about his remorse. He’s “begun to atone.” Bess loves that. It’s a pop culture reference and a Jewish thing! This guy might have a future as a blogger. Or as Maureen Dowd. My God this man is full of himself. He’s bragging about his accomplishments. And it&apos;s done. He has tendered his resignation. It’s effective next week! Ten days after the news broke! Someone put a net over the Hudson to stop Spitzer from ditching his computer into the river! Downside for citizens of New York: Another week of government paralysis. Chaos. Possible dark deeds. 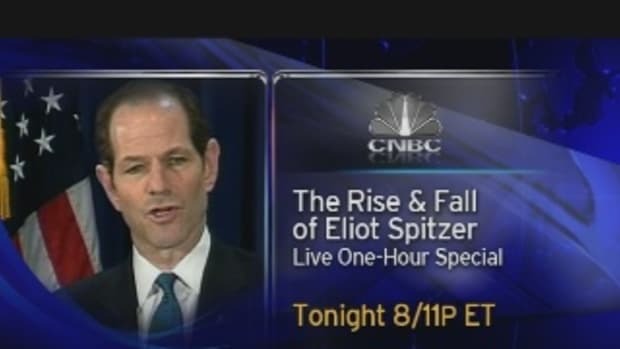 Upside for DealBreaker: We get another week of Spitzer coverage! Query: Is that Eliot’s best impression of contrition?